Two eight cards, we have here, with rather different images. 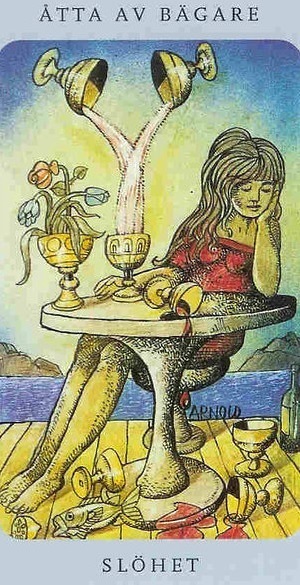 In the eight of cups we have an image of overindulgence, or perhaps apathy - unwillingness or inability to appreciate the plenty all around. The woman sits at the table, barely awake, with wine spilt, food and drink knocked over and wasted on the floor beside her. Flowers are still blooming in the table-cup, but already we see them beginning to droop and wilt. Meanwhile, more wine still is being poured - more more, always more. Is she sitting on a dock of some sort, or is that a stage, the beautiful scene behind her simply a painting, an illusion? Does it matter? Interesting phenomenon this card reminds me of - the fact that sometimes, plenty can be as much of a curse as lack. Not just in the simple sense, over-indulgence in food or drink but in the way it takes away the drive to work, experiment, improve. In political science and economics there are frequent references to the so-called 'resource curse' wherein countries that have plentiful natural resources, particularly oil and gas, tend not to develop diverse or advanced economies and often have stagnant/repressive/unstable political systems as well, whereas some of the most dynamic economies in the world can be found in places with almost no natural resources to speak of at all - Singapore being one oft-cited example. Why is that? Because why invest in building infrastructure, why take on the risk entering the unknown, why go through the hassle of dealing with international investors or partners when you can just sell sell sell what you have and they don't? Why satisfy your people with meaningful political reforms if you can buy them off with your oil money? Likewise, over-abundance can undermine the ability to appreciate what you have. Who hasn't met or heard of a young child, toys enough to fill so many rooms given by well-meaning parents or relatives, and each played with for a bit and then ignored. Fancy, expensive toys they can be, but when you have so many of them, and the certainty of getting yet more, how could you possibly care much for any one of them? You think of them as disposable because they become so. Contrast that with the child who only has one doll, or even siblings made to share it. It could be a cheap doll, comely, home-made, falling apart - but it is your one toy, your one treasure, to love and to guard carefully. Appreciation, and satisfaction. While I'm certainly not the type to constantly buy the newest, shiniest things, not the type that sees giving expensive gifts as the most meaningful expression of feeling, neither do I subscribe to the belief that things/possessions are unimportant. 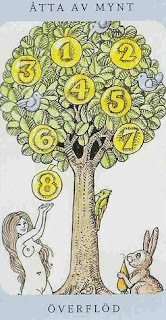 In the second card, the eight of disks, woman and rabbit and birds all enjoy the tree, the shade it gives, the shelter and the fruits which can be harvested. When you work hard to get something, or when you create it because the process of creating - whether gardening, painting, or even putting a computer together - is something you enjoy, then yes the resulting possession can bring you real joy and happiness. When you choose what you let yourself have carefully, realistically, getting only those things that you know are best for you and letting the rest go instead of trying to grab one of everything, it becomes much easier to connect with what you have. Different people and creatures can enjoy the same thing, the same tree, in various ways. Enjoy what you truly need and love, and be willing to let go of the rest.